Students for a Democratic Society stands with the Kidapawan Farmers of the Philippines in their fight for immediate relief from a drought they are suffering, and for food. 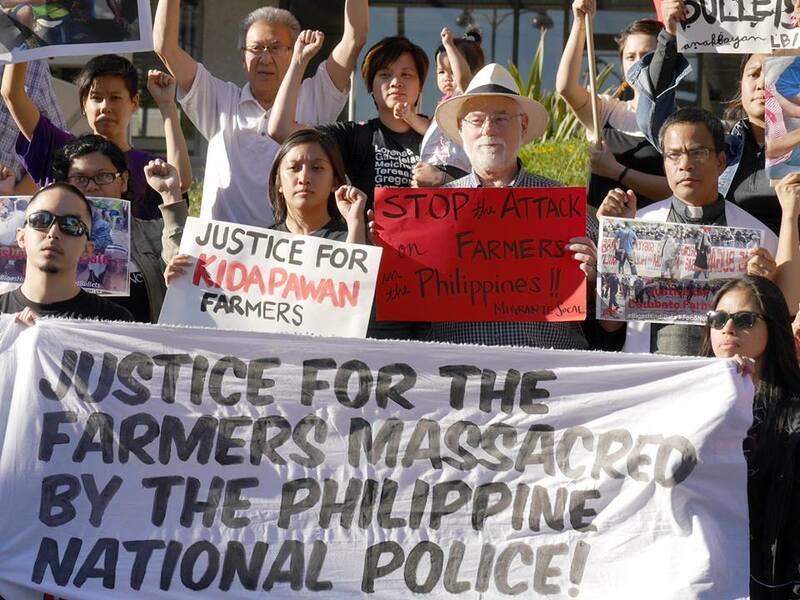 We also strongly denounce the deplorable actions of the Filipino government and police who opened fire on protesting farmers, killing three and wounding over a hundred. The actions of the Filipino government and Aquino administration cannot be excused. The local farmers in the Kidapawan area came out in the thousands to demand that the government give them relief in the form of rice subsidies. However, instead of receiving the help they needed, their barricades were brutally dispersed by the Filipino police using live ammunition. What followed has been days of harassment, threats and violence against the thousands of farmers who found refuge in the Spottswood United Methodist Church compound and their supporters. These actions are unacceptable and it is important that the Filipino government officials and police be held accountable. Here in the US, we need to be constantly aware of the wars and conflicts our own country bankrolls in order to maintain and further the US military and economic position on the world stage, and the adverse effect these wars and conflicts have on people the of the world. Since 2002, the United states government has given the Filipino government over 500 million dollars in military aide. Additionally, there are over 7000 US troops within the Philippines who work with the Filipino military to intimidate the populace and repress people's movements. The US government props up the Aquino government to advance the US military and economic position in the region at the cost of the Filipino people, and to benefit a handful of wealthy elites who purchase Filipino land, resources, and labor. We need to stand firmly against US military aid and intervention in the Philippines on our campuses and in our communities. The League of Filipino Students at San Francisco State University along with the International Coalition for Human Rights in the Philippines NorCal held an event “Indignation protest for the Kidapawan Farmers” on April 5th at the San Francisco Philippine Consulate. We encourage students to also fight to hold the Filipino government accountable, and to hold the US government accountable for our hand in these atrocities.